Sturdy, fast-growing, and Earth-friendly, bamboo is proving ideal for homes in disaster zones and celebrity bungalows in Hawaii. Will it catch on in the continental U.S.? As a construction material, bamboo possesses almost action-hero qualities: Tougher than concrete! (BAM!) Grows three feet in a single day! (WHOOSH!) Stronger than steel! (CRUNCH!) OK, so that last one is overblown; bamboo has about half the strength of mild structural steel. It’s still an ideal substitute for steel in many situations, and good design as well as promising bamboo composite materials expand its potential. The other claims are actually true. Bamboo’s compression strength is more than twice that of concrete and the fastest-growing bamboo can reach 35 inches daily. That makes it a renewable resource par excellence. In fact, bamboo is the most environmentally sound building material there is. Ecological benefits alone would commend bamboo to engineers, architects, and builders at a time when production of cement and steel contribute heavily to greenhouse gas emissions, aggravating climate change. They’re one reason Vo Trong Nghia, a Tokyo-trained Vietnamese architect who specializes in green buildings, calls bamboo “the steel of the 21st century.” Technically a grass, it photosynthesizes year-round, continuously breathing in carbon dioxide and expelling oxygen. The leaves it drops fertilize the land around it, promoting healthier soil and a more robust ecosystem. Plants reach maturity in five to six years, compared with timber’s 25-30 years (depending on whether it’s soft wood or hardwood). And it takes up much less land—building a 1,000-square-foot home requires only 1.9 acres of bamboo compared with 13.77 acres of loblolly pine. Unlike timber, bamboo is most commercially viable when it’s not clear-cut because it needs the intact rhizome root system around it to regenerate, which has the added benefit of staving off erosion. But bamboo is also particularly well-suited to construction in zones prone to extreme weather and natural disasters, such as earthquakes, where structures built of conventional concrete can become death traps. As engineers in the Philippines, Nepal, and Ethiopia have shown, flexible, lightweight bamboo can bend with the earth’s fluctuations without snapping, whereas heavy, rigid concrete is likely to crack and collapse. And even if a bamboo structure collapsed, it’s safer to have lightweight walls and ceilings fall inward than walls made of concrete and steel. Luis Felipe Lopez saw how bamboo homes defied earthquakes in the coffee region of Colombia called Sevilla, where he grew up. “It was coffee farms and bamboo,” he recalls. “The coffee and the bamboo in Colombia have close relations. I grew up in a bamboo house.” Studying civil engineering at the University of Colombia in Manizales for undergrad and the Los Andes University in Bogotã for his master’s, Lopez decided early on to research bamboo as a construction material. “I thought that the houses I grew up in looked very nice and performed well in earthquakes,” he says. Lopez decided to dedicate his research to bahareque (pronounced “bah-hah-ray-kay”)—an ancient Central American form of traditional architecture that uses bamboo or timber framework covered in mud or clay, after a magnitude-6 earthquake hit the Colombian coffee region, killing at least 1,185 people and destroying 60 percent of the buildings. The bahareque structures remained standing with minimal damage. With the assistance of the Colombian government and the Colombian Association of Seismic Engineering, Lopez helped establish the first official Colombian Bahareque building code in 2002. Then, in 2009, he helped publish the Colombian Code—a new chapter to the bamboo building standard that related to large-scale construction and has served as the basis for several countries’ building standards. Lopez has since moved to the Philippines, where he is confronting an image problem bamboo faces there and elsewhere in the developing world. Bamboo is shunned as a poor person’s material in areas where it grows best–areas that include some of the most geologically volatile places on Earth. These places are where cheap, light, sturdy, flexible, and quickly built housing is the most important. In the Philippines, there is a Tagalog creation myth dating back a thousand years or more, in which the first man and first woman were born from two halves of a split bamboo stalk. Named Malakas and Maganda, they represented dual halves of strength and beauty, just as bamboo does to the culture. Malakas at Maganda is a popular image that still pervades the culture. For many Filipinos, bamboo is not just an integral part of life; it is the source of all life. Younger bamboo is used for everything from food and clothing to a wide array of musical instruments and art, while more mature bamboo is used for housing. Filipinos built traditional nipa or bahay kubo houses from bamboo on stilts and moved around whenever the inhabitants wanted to move. But when the monsoon seasons came, the houses would be blown away and the people would rebuild in the following year. For this reason, bamboo houses are seen as old-fashioned and flimsy. As lead engineer at the Base Bahay Foundation, which concentrates on sustainable construction, Lopez demonstrates what a difference formal engineering training can make. Most indigenous structures built with bamboo are created informally, without the help of building plans or trained professionals. Lopez’s houses incorporate bahareque technology as well as traditional indigenous and European timber techniques to withstand the unique weather challenges that Filipinos face: namely, an average of 20 yearly typhoons in addition to earthquakes. He first had to prove that his houses could withstand the force of the wind. “We already knew from Colombia that these houses were good in earthquakes, but what happens in typhoons?” Lacking a local wind tunnel lab, Lopez wanted to fund research at a European university, but the cost proved prohibitive. Instead, he and his team built a trio of houses for a test that he called the “Three Little Pigs” on the peninsula of Bicol, an eastern coastal region that is “the most dangerous part of the Philippines for typhoons. Every year, one or two of the biggest touch down there.” He outfitted them with external weather stations and sensors. Each house was built to different specifications—one with the highest quality, most expensive materials; one with a mixture of experimental materials; and one with fewer materials at a lower cost—but all in the CBF style. They ended up directly in the path of 2014’s category five super typhoon Glenda. The weather stations recorded wind speeds of 115 mph before they were damaged by the gust (“we don’t know if it was higher than that,” Lopez says), but the houses remained undamaged. They soon after withstood Typhoon Ruby, which reached sustained wind speeds up to 109 mph, according to local news reports. “This was our confirmation that the houses would work,” Lopez said. Like the Philippines, Nepal and Ethiopia are two countries where bamboo grows prolifically but is not thought of as a permanent construction material. Following last year’s earthquakes in Nepal, much of the region has remained devastated. According to the United Nations, more than 8,700 people lost their lives and hundreds of thousands of people were displaced from their homes with an estimated $3.3 billion in damage to houses. “More than 14,000 schools were damaged or destroyed,” says Nripal Adhikary, founder and director of ABARI, a design and architecture firm that applies modern engineering to vernacular Nepalese architecture to produce affordable, eco-friendly, and disaster-resistant housing. With no place—school or home—for children to go during the day or night and families broken up or thrust into poverty, many people have fallen prey to human trafficking, which has spiked to new levels since last year’s earthquakes. The Nepali police report that children are lured by traffickers (or given away by their families) with promises of jobs or free education in India or other parts of Nepal. They are instead either sold into slavery or brothels. While hard data are difficult to come by due to the secretive nature of trafficking, the police estimate that human trafficking in post-earthquake Nepal (an area already prone to trafficking) is up by 15 percent. Stable houses and schools are imperative for human health and safety. To that end, Adhikary works with bamboo and earth. Nepalese bamboo suffers from the same stigma as in other countries: It’s thought of as a poor material. Timber has been preferred in the past, but it’s becoming more scarce, so Nepalese have turned to imported, expensive concrete. “Now people are thinking more about bamboo again because of eco-consciousness—I’m working on changing the perception of bamboo into something modern,” he says. Adhikary is modernizing a traditional “rammed earth” building system that had fallen out of favor architecturally. It combines tamped clay, sand, and aggregates with rebar and polypropylene to ensure stability in natural disasters. In Ethiopia, official acceptance of bamboo is proceeding, although change takes time. A nexus in building awareness is the Ethiopia Institute of Architecture and Building Construction at Addis Ababa University, where Ph.D. candidate Denamo Addissie Nuramo established the National Bamboo Construction Center (NBCC) in 2012. The NBCC aims to fill what Nuramo found was void in teaching and widespread ignorance of bamboo in industry. Since its inception in 2012, the NBCC has recruited and trained about 200 undergraduate students in the construction, architecture, and engineering disciplines. What has surprised him most is the number of women clamoring to participate. “In Ethiopia, such hands-on and practical assignments are dominated by boys,” he says. “But here the girls were highly involved. I would say that more than 30 percent of our club were women.” NBCC puts on an annual competition. The most recent one, sponsored by the United Nations High Commissioner for Refugees, had students design transitional housing for Sudanese refugees. UNHCR has said it will adopt the winning design. Nepal’s housing problems are an extreme example of a larger issue inhibiting potential bamboo builders: There are few formalized plans in place, and those that exist aren’t cutting it. 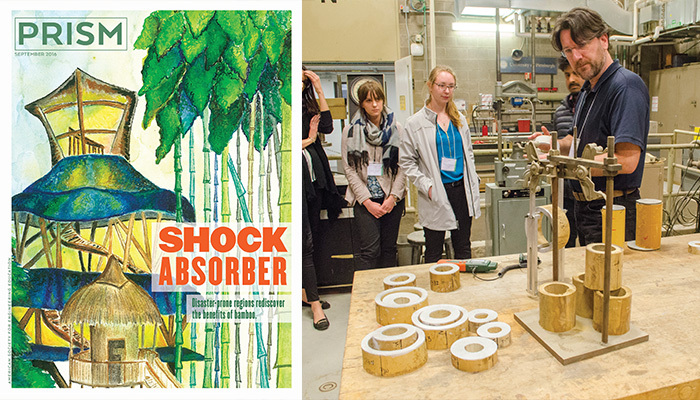 In May, engineers, construction experts, teachers, and students from 14 different countries and territories, all with a passion for building with bamboo, gathered at the University of Pittsburgh to put together the Pittsburgh Declaration. It is “a global call-to-action that seeks to increase international recognition of the benefits of bamboo,” according to the introduction. This call-to-action requires the support of INBAR (the International Network for Bamboo & Rattan) to lead the way in developing and revising existing ISO (International Organization for Standardization) standards. ISO standards are the rules that govern how bamboo-based materials and structures should be tested and come together—how they are joined or assembled, how they have to act in a fire, allowable levels of stress, basic design concepts and calculations, and many other calculations that go into the testing of the materials and the construction of structures. They make sure that all builders are on the same page when it comes to material and structural quality. “An engineering material needs some form of standard on which we can call it an engineering material. We have them for timber, for steel, for concrete, for plastics, for every other material. We need to have standardization,” says Kent Harries, associate professor of structural engineering and mechanics at the University of Pittsburgh. He is a founding member of INBAR’s construction task group and author of the new ISO standards. INBAR is an intergovernmental network appointed by the United Nations that includes 41 countries and territories, most of which include bamboo-heavy regions. Harries says the NSF grant would signal that the United States is starting to see bamboo as a legitimate, mainstream material with a future in this country. Andrew Linn sees that future clearly. A structural engineer who helps run Becker Linn designs, a sustainable architecture firm, he is an ambassador for both the World Bamboo Organization and the American Bamboo Society. His turquoise home and office sits in Anacostia, a neighborhood in southeast Washington, D.C., in sight of the Frederick Douglass house. “This house was built in 1892, back when Frederick Douglass was still alive,” Linn says. Fusing bamboo and historic preservation, he and his wife, Hannah, and business partner, Jack Becker, have converted the house into a model of sustainable architecture. Standing in the small entrance foyer, he gestures to the wider room beyond. “Someday, this will become a classroom of sorts. We’ll replace this wall with clear plexiglass so you can see through to the main house where we kept the exposed rafters from the original construction.” Linn’s classroom-in-progress has been developed with bamboo throughout, either locally hand-culled or collected from abroad (although he is somewhat proud of the bamboo pieces purchased from Ikea, excited about their obvious commercial success). A kitchen screen uses bamboo collected from a Silver Spring, Maryland farm and heat-cured by hand. The wine rack is bamboo; so are the window blinds, tapestries, and hats on the walls. Each section of the garden houses a different variety of bamboo engineered by Susanne Lucas, a horticultural specialist who specifically selected plants for optimal growth in the southeastern United States. It also showcases different plants such as fruiting vines and flowering trees from different environments that work in different weather conditions. It’s a colorful outdoor lab experiment to see how the different plants work best together. Driving a visitor through Southeast Washington, Linn points out three forlorn commercial properties he hopes to purchase: a boarded-up building and adjacent salon and convenience store. He’s not sure what will fill that spot, but he can imagine a bamboo restaurant with a bamboo grove out back where people could dine al fresco under a leafy canvas. Chances are, cultivation of bamboo in the United States will be limited. Many jurisdictions consider it an invasive weed. Linn admits that some of the spreading varieties can easily take over a yard if not well tended. Otherwise, it grows well only in certain parts of the country—mostly semi-tropical areas that are either protected or have high property values, like southern Florida, which would render it nearly impossible to plant on a commercial scale. Cover image courtesy of Jennifer Pocock.